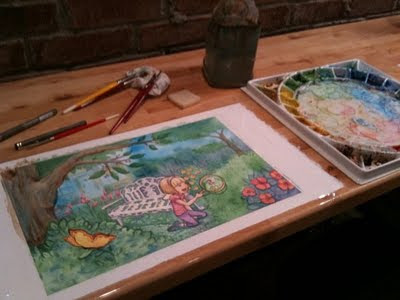 Well I finally finished illustrating the Fairy Garden book. Even though I had less time in months to work on this book, I think it especially felt like a long job because there were more than the usual number of illustrations for it and a lot of changes during the process. It's always nice to finish a job though. Even if you love the book, you need some space from it before you like seeing it again. On that note, I was happy to receive an advanced readers copy of the chapter book I illustrated, "Chihuahua Chase." It's always fun to see a book in printed form, and then smile because you know all the blood sweat and tears that went into it. Happy reading, everyone. I've been working on this fairy picture book for months now and it's been a LONG process. I have a lot of stories to tell associated with the work on this book, but those aren't for sharing on a blog. The good news is that I'm almost finished. Here's some of the work in progress. 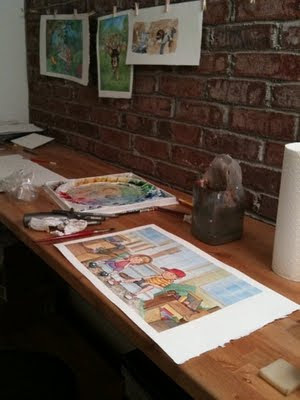 I paint by hand with watercolor and then scan in the painting and add textures and do more painting digitally. (Ann, you'll notice some of the "Chihuahua Chase" pictures up on the wall behind, since I'd just finished that one). In the meantime, I'm enjoying the fall weather and the changing leaves. I miss my childhood home with the woods in the back yard. I'd sit for hours under those trees just staring at all the colored leaves, inhaling their smell, feeling their crunch. I do have the mountains covered with trees to gaze at here, but living in a subdivision that was clearcut farmland just 7 years ago, leaves a lot to be desired as far as mature trees. Sounds like it's time for a drive.